Last week I had the chance to revisit one of Colorado’s less touristy gems - Colorado National Monument. Located just west of Grand Junction and south of Fruita, this national park sits high on the Colorado Plateau. 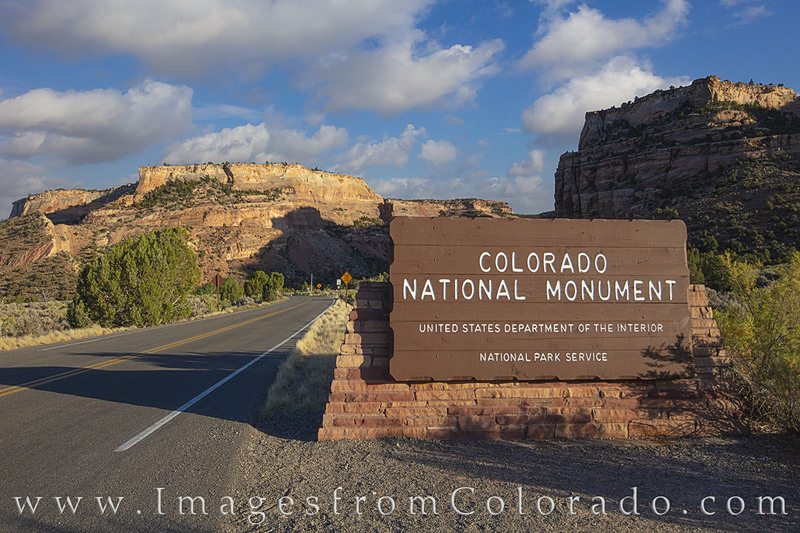 The entrance to Colorado National Monument, just west of Grand Junction, welcomes visitors ahead of what will soon be amazing landscapes and vantange points in this amazing park. The park's main road, Rim Rock Road, winds over 22 miles as it makes its way around the rims of several canyons. 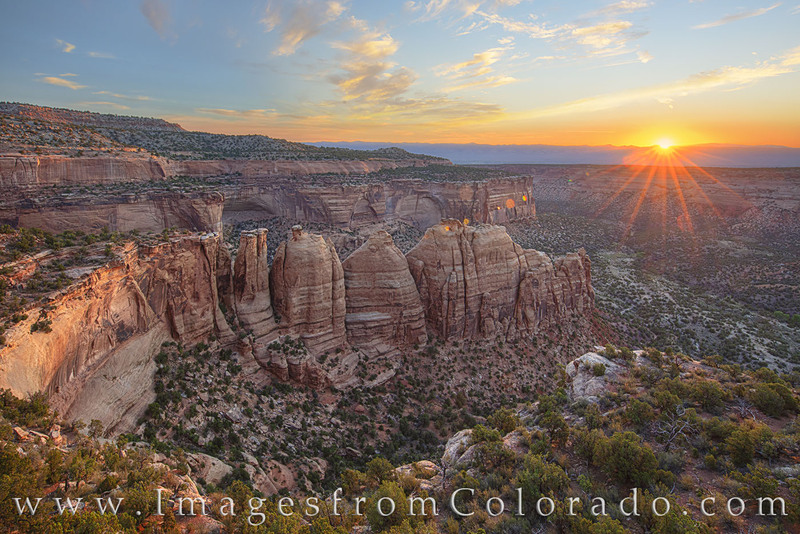 Colorado National Monument came into existence on May 24, 1911, primarily because of the efforts of John Otto. He worked tirelessly to make his beloved canyons accessible to everyone, and spent his days building trails leading into the canyons. After the US government officially established the land as Colorado National Monument, Otto worked for 16 more years as the park's first manager while living in a tent and earning one dollar per day. As I drove the length of Rim Rock Road more than several times over the week, I couldn’t help but imagine the difficult and painstaking efforts it must have taken to tame this wild place. Despite the heat of June and July, temperatures in the higher elevations of the canyons cool off in the evenings, and since my work takes place around sunrise or sunset, shooting at these times was really enjoyable. The colors of the sky did not disappoint either, as pinks and blues often painted the sky. A while back, I bought a book by a Colorado photographer discussing his favorite places to shoot. With a section on Colorado National Monument, I figured the cheap price might give me some ideas I would otherwise have overlooked. As it turns out, we apparently have very different ideas on when to shoot. I almost always prefer to shoot towards the sun at sunrise and sunset. This affords the opportunity to capture a starburst at the moment the sun rises over or falls below the horizon. The colors of the sky are also much more vibrant when shooting towards the sun. Please keep in mind that for sunrise I’ll start shooting about 30 minutes before the sun makes an appearance; at sunset I’ll shoot for the 30 minutes from sunset until dark. when the sun is full on in view, I'm done. Anyway, the suggestions made by this photographer were the opposite of what I like. Fortunately, I had done my research using detailed Google maps, the Photographer’s Ephemeris (shows where the sun and moon rise and set each day), and a detailed park map to become familiar with the hiking trails. So reversing the information in the aforementioned book, I found this park to be best shot at sunrise. One place for an early morning visit is the iconic Independence Monument in the northern portion of Rim Rock Road. This is the classic view that appears on postcards and chamber of commerce flyers. Independence Monument is perhaps the most iconic view and formation within the Colorado National Monument boundaries. Seen here about 30 minutes before sunrise, the lights of Grand Junction can be seen shining in the early morning hours. The horizon lit up briefly in an orange glow before giving way further to sunrise. The Coke Ovens is another place worthy of a morning stop. A trail takes you as far down into the canyon as you want to hike, but remember you have to hike back, too! The morning light seems to make the ovens glow in warm orange light. 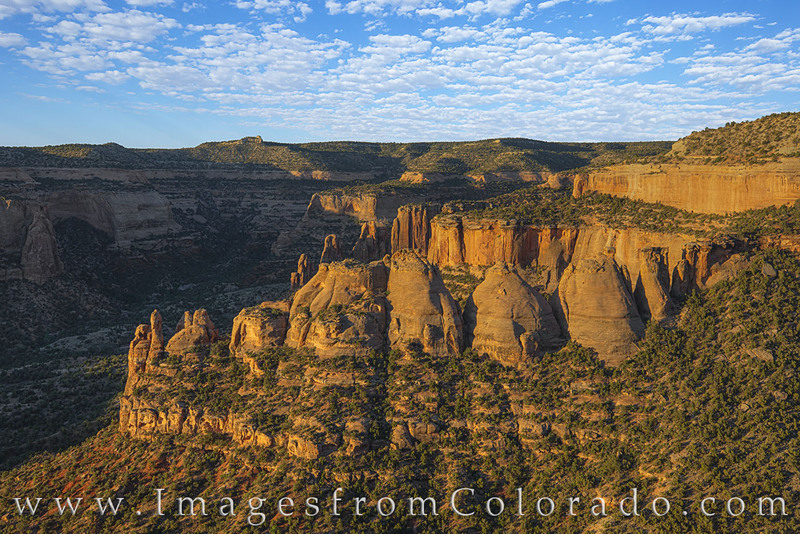 From along Rim Rock Road, the Coke Ovens in Colorado National Monument light up in the first light of morning. Seen here with soft blue skies overhead, this rock formation is one of the most distinguuishable in the park, and the viewing options come from many different vantage points - whether from along the road, from a few pull-outs, or even from hiking options. Near the Coke Ovens is Artists Point. This vantage point provides an overview that takes in sweeping vistas of Monument Canyon. 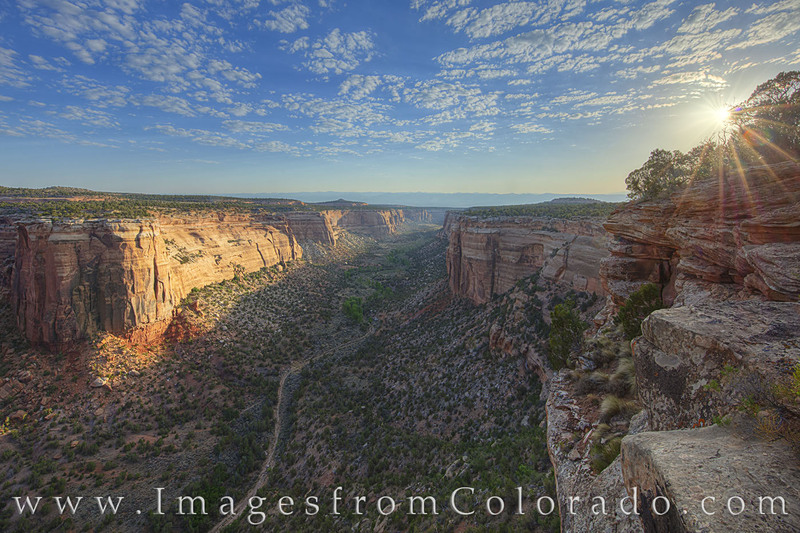 Along Rim Rock Road in Colorado National Monument, the sun rises over one of the famous viewpoints - Artist Point. Here, grand views of Monument Canyon stretch out into the distance, and the beauty of the Colorado Mesa is on display. A couple of my favorite locations include Ute Canyon View (a marked stop not to be confused with Upper Ute Canyon Overlook, and Monument Canyon View (an overlook and stop, but there are also trails to walk down for better and even more impressive views of Monument Canyon. Monument Canyon is again best shot at sunrise in my opinion. The monolith is that rise from the canyon floor reflect the orange sunlight, and if clouds are present the morning sky can add to the rugged beauty of the landscape. From the Grand View Overlook in Colorado National Monument, the canyon walls and rock formations are breathtaking. In the distance, the towns of Fruita (left) and Grand Junction (right) can be seen through the canyon openings.This Colorado panorama is available in larger and custom sizes. The interpretive trail at Ute Canyon View is unique because both sunrise and sunsets both offer places to capture a starburst. I’d recommend exploring beforehand to find what fits you best. The rim of the canyon offers a landscape where two canyons, Ute Canyon and Monument Canyon, flow together, forming a confluence of two deep ravines.i visited this location for both a sunrise and sunset shoot and appreciated each equally. Ute Canon stretches out into the distance, deep and wide. Overhead, the rising sun peaks through the pine trees, and below my feet is a steep cliff. Far below in the canyon, the Ute Canyon Trail can be seen winding into the distance valley. This view is just off Rim Rock Road and only requires a short walk to see this amazing landscape on the western slope of Colorado. A few trails lead into Monument Canyon. The views along these thin trails mekes for great landscape shots, and a wide angle lense will really be helpful. For example, I used two lenses, primarily, that covered 11mm to 35mm. I sprinkled in the use of a 24mm-105mm as well as a 400mm, but wide anlges are the way to go. While out and about in the early morning hours, I saw several forms of wildlife, including rabbits, lizards, bighorn sheep, and even, I think, a bobcat. In the afternoons, with the western slope temperatures reaching 108 one afternoon, my wife and I escaped to Palisade to enjoy an afternoon of wine tasting. Our favorite was the Meadery of the Rockies. We’ll never claim to have the most refined wine tastes, but we did like the fruity and sweeter wines (we compared one of the desert wines to our favorite sweet wine from Italy's Cinque Terre region -sciacchetra. The folks running this homey and honey winery were laid back, kid-friendly, patient, and helpful. We’ll be back, for sure! Now, I’m already planning on returning to this area for more exploration of this amazing and relatively unknown Colorado gem. In the meantime, safe travels, everyone. If you have any questions about this blog covering recent trips to Colorado National Monument, please do not hesitate to contact me. 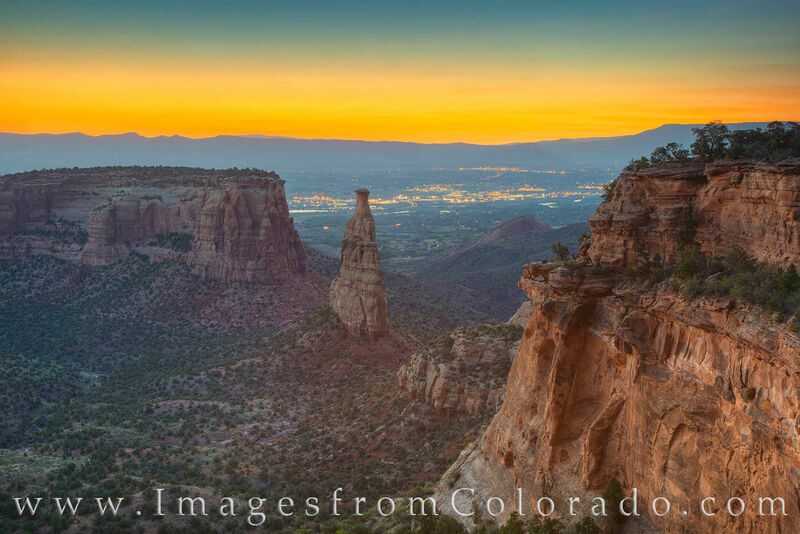 Posted in travel, Colorado national monument, western slope, Colorado plateau, canyons and tagged colorado national monument, favorite places, best places to shoot, monument canyon, ute canyon, independence monument, grand junction, fruit.